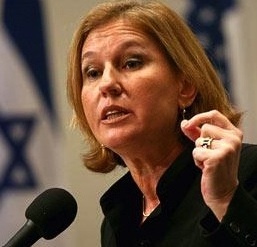 Justice Minister Tzipi Livni is the Israeli cabinet minister with the task of finding a way back to peace talks. At the moment, she is one more frustrated negotiator. Justice Minister Tzipi Livni warned Monday at an accountants’ conference in Eilat that lack of progress on the Palestinian track could lead to a potential disaster for Israeli exports. “Europe is boycotting goods,” said Livni, head of Israel’s negotiating team with the Palestinians. “True, it starts with settlement [goods], but their problem is with Israel, which is seen as a colonialist country. Therefore, it won’t stop at the settlements, but [will spread] to all of Israel,” she said. Political realists who follow the shenanigans of Israel’s right-wing government suggest that Livni may be involved in a strategy to jump start the negotiations. She may also be playing the “good cop” to signal potential European boycotters that Israel does have a few reasonable leaders. That, however, is an unrealistic rejection of hope in a time of darkness. If Livni, a major Israeli cabinet figure, recognizes the growing danger of a worldwide boycott, the least we can do is take her at her word and see what she and U.S. Secretary of State John Kerry are trying to work out. She acknowledged that Israel is its own worst enemy when it refuses to see the impact of boycotts on Israel. It is in this sense that Livni (right) has a much stronger grasp of what is best for Israel than those U.S. religious leaders who still believe in the superiority of interfaith exchanges over working for justice. As long as Israelis don’t pay a price for the occupation, or at least don’t make the connection between cause and effect, they have no incentive to bring it to an end. And why should the average resident of Tel Aviv be bothered by what is happening in the West Bank city of Jenin or Rafah in the Gaza Strip? Those places are far away and not particularly interesting. As long as the arrogance and self-victimization continue among the Chosen People, the most chosen in the world, always the only victim, the world’s explicit stance won’t change a thing. It’s anti-Semitism, we say. The whole world’s against us and we are not the ones responsible for its attitude toward us. . . . Most Israeli public opinion is divorced from reality − the reality in the territories and abroad. Israeli’s right wing media, like its counterparts in the U.S., promotes the public’s “divorce from reality” by calling actions supporting Palestinian justice as anti-semitic attacks on Jews. To the Times of Israel, opposition to Israeli self-absorbed policies are seen as ongoing battles in a theater of war. This recent Times story was explicit: From the war in Iraq to the battle against Israel boycotters. In that piece, war strategy is transferred to a political strategy, designed to defend Israel from criticism. Can an idea honed on the battlefields of Iraq and Afghanistan prove effective in defending against assaults on Israel’s legitimacy in North America? David Dabscheck, deputy managing director of the Israel Action Network [IAN], thinks so. The idea, in the words of General Stanley McChrystal — commander of the US Joint Special Operations Command — that “it takes a network to defeat a network” played a central role in his concept for fighting insurgents in the Middle East . . . . The two-year old Israel Action Network figured it needed to form a network to combat its own enemy network. A boycott is the least of all evils, and it could produce historic benefits. It is the least violent of the options and the one least likely to result in bloodshed. It would be painful like the others, but the others would be worse. On the assumption that the current status quo cannot continue forever, it is the most reasonable option to convince Israel to change. Its effectiveness has already been proven. More and more Israelis have become concerned recently about the threat of the boycott. When Justice Minister Tzipi Livni warns about it spreading and calls as a result for the diplomatic deadlock to be broken, she provides proof of the need for a boycott. She and others are therefore joining the boycott, divestment and sanction movement. . . . .
Not a bad outcome for a non-violent movement which began when “In 2005, Palestinian civil society issued a call for a campaign of boycotts, divestment and sanctions (BDS) against Israel until it complies with international law and Palestinian rights. A truly global movement against Israeli Apartheid is rapidly emerging in response to this call”. The picture at top of John Kerry with Justice Minister Tzipi Livni was taken in Rome. It is from The Times of London. The picture is by Kerry Miaden Antonov/Reuters. The picture of Tzipi Livni is from AFP/Getty. “We are all settlers,” says Gideon Levy to his fellow Israelis. People should not by any Israeli products, the way south African products were boycotted to end apartheid there. Israel’s violence, house domoitions and land theft based of religeosu identity is a great evil, and only a powerful world wide boycott of all israeli goods may help to end the cruelty of apartheid in Israel. We need not only to boycott Israeli products but to carry the fight to our own Pension Boards and corporate bodies, insisting that–in our name–they divest of Israeli related stocks. As hard as it is for me to say this, we will also need to discourage travel to Israel–and that means Palestine suffers, too, and Palestinian Christians, as well. Jim, while I admire your reporting as always, this is a painful (read on) narrative for me. Raising Tzipi Livni to be the last hope for sanity and peace-making is like trusting a copperhead snake because it may be less poisonous than a rattler. Livni is the former Mossad agent who intoned in 2008, as she was Zionist Israel’s Foreign Minister, “We will go wild in Gaza.” (I checked and found my memory to be accurate: go to https://www.youtube.com/watch?v=pzIL2ikCuew .) That set the tone for the 2008-9 massacre where 1,474 or so Gazans were murdered by the Zionist regime, another 5,000 or so injured, and the place essentially leveled. This is also personal in that Hawaii’s first Jewish-and-woman governor, Linda Lingle, invited Livni to address an international women’s convocation in Waikiki, September 2007. Local activists tried, months in advance, to persuade local sponsors and the guv to disinvite Livni as no sort of role model to young women; but our voices were ignored. I was the sole picketer on the ocean side of Livni’s hotel early on the morning of her address to the throng, and a gutteral-voiced Zionist passing on the beach walk cursed at me and tore my protest sign out of my raised hands, wrenching my arms, neck, and back. My already compromised skeletal condition took a turn for the worse that day that still plagues me. Livni made her speech to fawning adulation; I saw the video of it in due course. Livni, cloaked by her 2013 snakeskin, is simply acting the “good cop” (as speculated above; that doesn’t mean at all to me that she is “reasonable” or ever wants the Palestinians to have justice, dignity, and their own state). She’s opportunistically aiming to raise her visibility for the furtherance of her Zionist political career, which will surely conclude with a term(s) as PM if she has her way. Mr. Stiver’s comment is appreciated and, as I’ve found usually the case, valuably informative. Livni is an arch Zionist, racist and avaricious to the core, who in a just world would be serving a life sentence handed down by the International Criminal Court. Parenthetically, I might add that the present Governor of Hawaii, Neil Abercrombie, was a firm friend of justice for the Palestinians during his long tenure as Representative from Hawaii in the U.S. House. I hope he’s been a good Governor. He had few equals in the House in battling AIPAC toe to toe. “Livni warns Israel that it faces a world wide boycott”, is a great article.